President Mohamed Amin, the first President of the Maldives, was the son of Athireegey Ahmed Dhoshimeynaa Kilegefaan and Roanugey Aishath Didi. He was a descendant of the famous dynasty of Huraa, from his father's side. In 1920, he went abroad to Ceylon (now Sri Lanka) and studied at St. Josephs College. In 1928, he went to India to study more and returned to Maldives in 1929. After returning from abroad, he held many posts in the government including the post of Chief Officer of Customs, Head of the Maldivian Post Office, Minister of Trade, and member of the first Maldivian Parliament. Mr.Amin Didi was also the principal of Majeediyya School from 1946 to 1953. 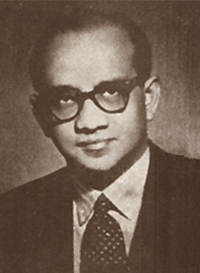 Mohamed Amin Didi was the leader of the first political party in the Maldives, Dhivehi Rayyithunge Muthagaddim Party (Peoples Progress Party). With the support of the people, he abolished the 812 years old sultanate and became the first President of the Maldives on 1 January 1953. After the death of Sultan Abdul Majeed Didi and the loss at sea of his son Prince Hassan Fareed Didi, the members of the parliament chose Amin Didi to be the next person who is capable to be as Sultan. But Didi stood against it saying "for the sake of the people of Maldives I would not accept the crown and the throne". So, a referendum was held and the Maldives became a Republic. But the Republic was short lived and a revolution was brought by the people of Male’, while the President was in Ceylon for medical treatment. People of Male' appointed Velaanaagey Ibaraahim Didi, Vice President to President Amin as the head of the government. Mr Amin Didi was not aware of these events which had taken place in his absence and he returned to the country ignorant of what had happened. As soon as Amin Didi returned, for his own safety he was taken to Dhoonidhoo island and was kept there under the government's supervision with high quality services, the same as for the President. Four months after being taken to Dhoonidhoo, secret letters were exchanged between him and Ibrahim Hilmy Didi, to bring an end to this revolutionary government and to restore the monarchy, with Ibrahim Hilmy as the king and Amin Didi as the prime minister. And one night Amin Didi came to Male and tried to take control of badeyrige. People were so angry that he was nearly beaten to death. Then he was thrown into a small boat (bohkuraa near Male). Later, the leaders of this small rebel group who wanted Mohanmed Amin as their leader were brought to court including Mohamed Amin Didi, Ibrahim Hilmy Didi and Shamsuddin Hilmy Didi. These three people were sentenced to exile for life. Mohamed Amin was banished to K.Gaafaru, Ibraahim Hilmy was banished to K. Gulhi and Shamsuddin Hilmy was banished to K.hinmafushi. As the former president's health deteriorated, he was brought to Vihamanaa Fushi Island (now kurumbaa village). On 19 January 1954, the first president of Maldives his country died. A small funeral was held on Vihamanaa Fushi. He is still honoured by the citizens of his country even today for being the first president of Maldives and for making the democracy to come alive in this little country. He is also admired by a lot of citizens in Maldives along with his enormous family. He was well known for his efforts for the advancement of women and education in Maldives. Amin Didi has one daughter and four grandchildren. One of his grandsons, Ameen Faisal is the National Security Advisor while his granddaughter is the Maldivian High Commissioner to the United Kingdom and Great Britain.